Remembering St. Nicholas today, can we identify those we could bring immense joy in this season leading up to Christmas? St. Nicholas, now turned into Santa Claus, brings great excitement to children in particular as they eagerly wait for him to bring them Christmas presents. Come December and the frenzy of Christmas celebrations begins building up. This year the 23-metre high Christmas tree in the Vatican was already up on November 22, though it will be lit up tomorrow — December 7. Along with the popular Christmas tree, there are other symbols, like the Star, the Crib and Santa Claus associated with Christmas. Today on December 6, the Church observes the feast of a holy man from the fourth century, who has become one of the most popular figures associated with Christmas, though he has nothing to do with it. Today is the feast of Saint Nicholas, who eventually metamorphosed into Santa Claus. The only connection Nicholas could have with Christmas is that he died in 343 AD just 20 days before Christmas. What made him popular is pure commerce. The blame for commercialising St. Nicholas goes to Coca-Cola, which in 1931 for the first time used Santa Claus with Coca-Cola in his hand. Though totally undesirable, Santa Claus, unfortunately, cannot now be detached from Christmas. Be that as it may, the question is, why would anyone think of using St. Nicholas to acquire fortunes, when he did was exactly the opposite? St. Nicholas, the then bishop of Myrna, in current day Turkey, was a generous and holy man. He is said to have inherited large family wealth, which he wished to share with the poor while remaining anonymous. The legend has it that in his town a poor man having three daughters could not get them married for lack of money. Nicholas, without letting anyone know, helped out the family. He managed secretly to throw gold coins into that house, which happened to land in a sock. Nicholas did the same for the second daughter. The word soon spread around about an unknown generous man in town helping the poor. The secret could not be kept hidden for long. 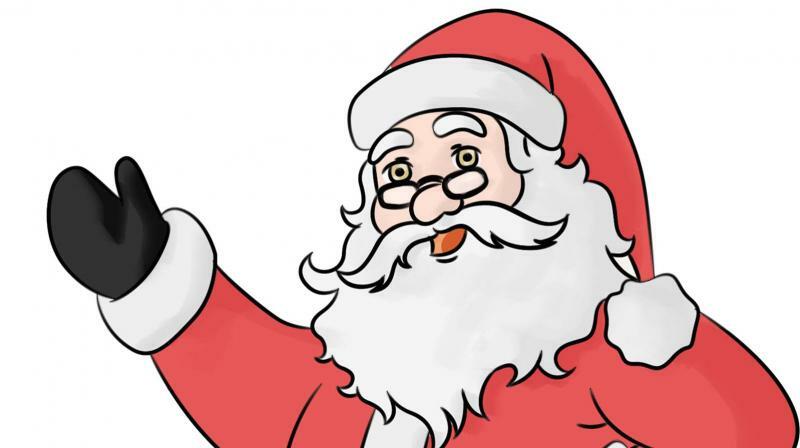 St. Nicholas, now turned into Santa Claus, brings great excitement to children in particular as they eagerly wait for him to bring them Christmas presents. In most families, after children have gone to sleep, parents put their Christmas gifts in socks and hang them on the Christmas tree or if they are big, place them in boxes under it. The grown ups exchange presents too. For good or for bad since Santa Claus has now become part of Christmas tradition, wouldn’t it be delightful to emulate his legendary generosity to share a little extra we have in our pockets and houses for the poor and the needy, be it money, food, medicines, clothes, books, toys and anything useful? Remembering St. Nicholas today, can we identify those we could bring immense joy in this season leading up to Christmas? And would doing it anonymously not make it doubly joyful.